In my old house, It was easy to make a festive first impression with my holiday décor, as the front door opened directly into the stair hall. Every year I would use either fresh or artificial garland on the bannister, punctuate it with a few bows, and weave white lights throughout. 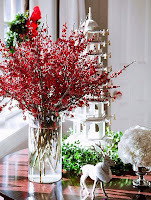 It was so pretty and festive, and an easy way to incorporate holiday décor into the entryway. 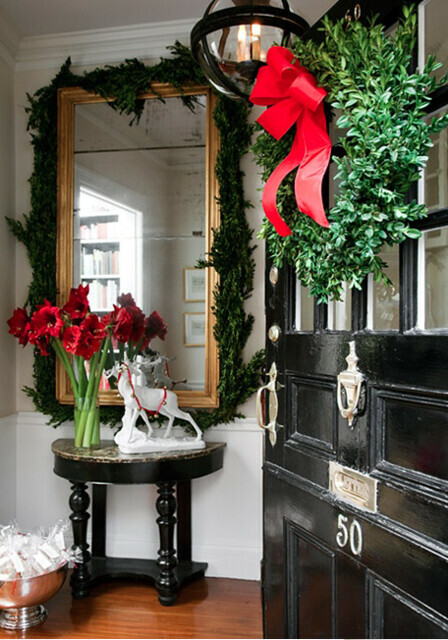 My old house had an entryway similar to this one in the 2013 AH&L Home for the Holidays showhouse. The staircase had windows in it, and a wide hall to the right. My garland was always much simpler than this, but it was very pretty. 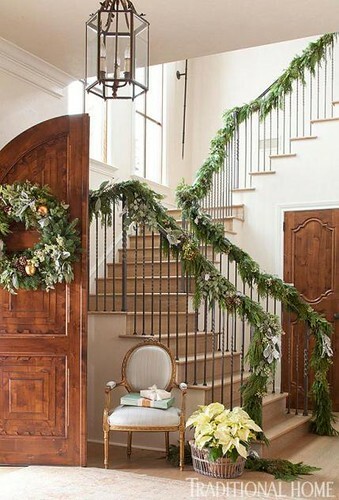 A beautifully decorated stairway is one of my favorite looks for the holidays. 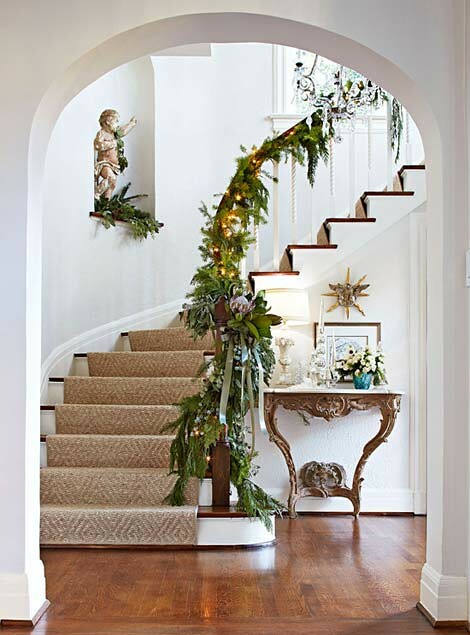 This image from Traditional Home features a beautiful holiday themed stairwell designed by Lisa Luby Ryan. 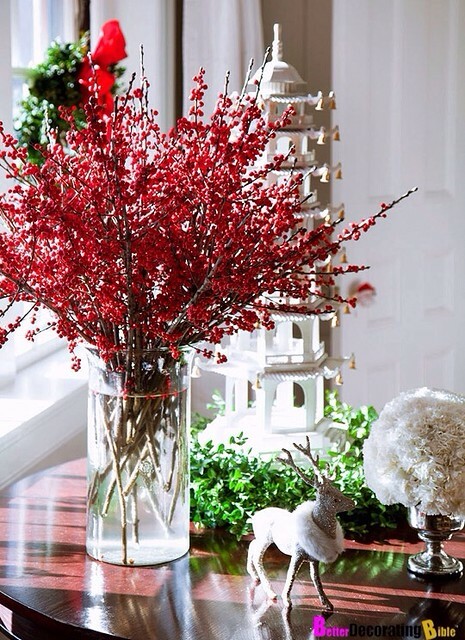 Traditional Home always has great holiday inspired décor in their end of year issue. When looking at the Traditional Home site for ideas, I came across a feature about ‘Festive Holiday Staircases and Entries’. It’s full of inspirational images! 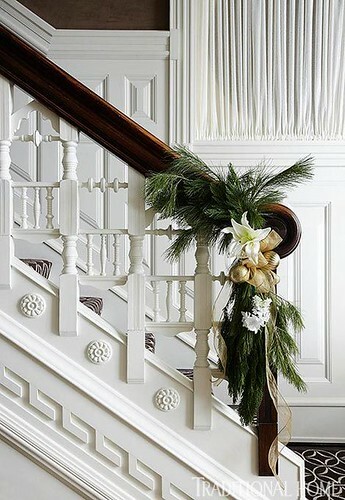 I love this simple approach to garland – especially when there is a the architecture of the stair design is so detailed. 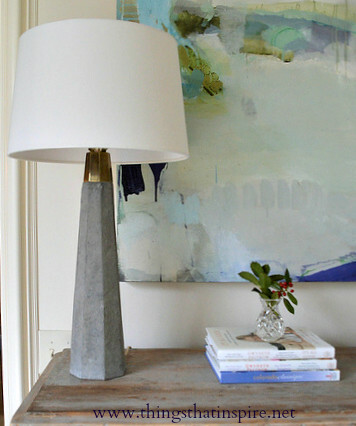 Just create a special focal point at the end of the stairs. Clean up is much easier too! 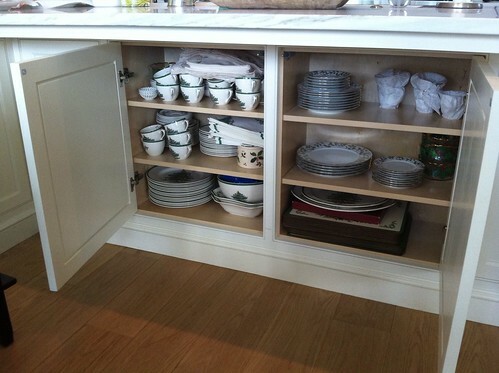 Via Traditional Home. Veranda also has a great gallery of holiday images. 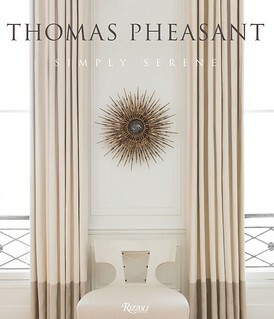 This one in particular captured my attention because of the soft, neutral color scheme, which is much more suited to my taste than the red that is so often used. 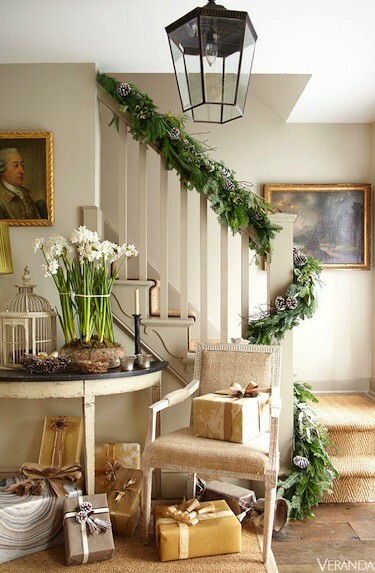 This picture shows both a stairwell and a table that has paperwhites, often used for holiday décor, and an abundance of presents. In my new house, the stairs are a bit more tucked away, and the entry is its own area. I didn’t even think about decorating it last year because there were no surfaces or usable walls to decorate. Since then, I have acquired a 40” antique center hall table that is on loan from my sister. I had a holiday gathering for my husband’s colleagues last weekend, and while preparing for the party, realized that I should probably put something festive on the table given that it was the first thing people would see when they walked into the house. I did not have much time, so I did a quick search on Pinterest and found surprisingly little for an entry space that is not oriented around a stairwell. I ended up finding this poinsettia topiary just a few hours before the party, and combined with some red and green votives. 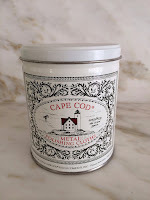 I didn’t even have time to find a planter or pot for the topiary, so kept the standard red foil that came with it. 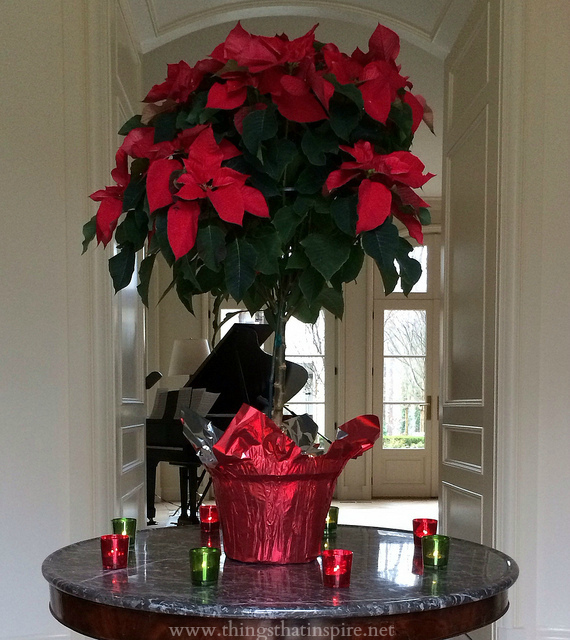 Many of the guests commented that they had never seen a poinsettia topiary, so it made an impression and worked well. After the party was over, I did a bit of research on inspiration images for entryway holiday inspired décor so I will be prepared with another idea for next year. 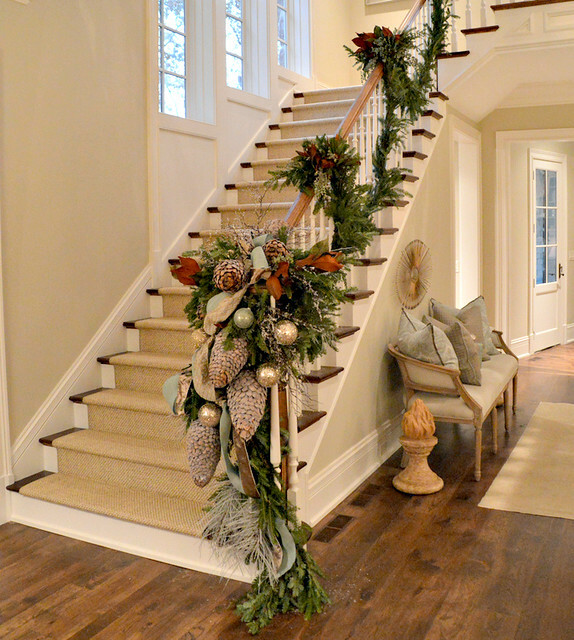 A few years ago, the AH&L Christmas house had a beautiful entry that did not feature stairs – and this is how the designer chose to decorate the space. I love the look of the branches with the glass ornaments hung on them, although the height is too much for my space given that I have a light fixture in the center of the entry. It’s hung pretty high, but these branches are quite tall. A closer view of the arrangement. The little wrapped presents are a nice touch. At an AH&L Christmas House a different year, a similar branch arrangement with ornaments was used in the family room/breakfast room area. This was one of my favorite images I found of an entry without a stairwell. The décor is simple but beautiful, with garland wreathing the mirror, and an elegant arrangement of amaryllis on the table. Via Traditional Home. The Four Seasons Resorts has a pinterest page full of holiday décor from their resorts around the world. 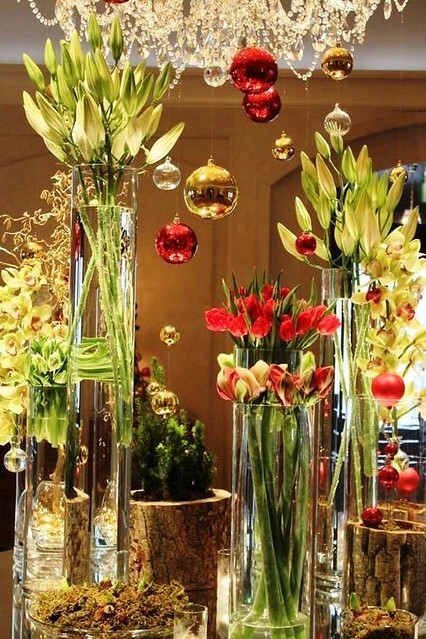 I thought this could be replicated in the home – using varying height vases and different seasonal flowers. However, it would need to be refreshed fairly often, and I would prefer an arrangement that would last throughout December. Another favorite image that I found features an abundant grouping of berries and branches in a vase. This would look lovely combined with more traditional greenery and pinecones. Image source. Another gorgeous red berry display, found on Pinterest. 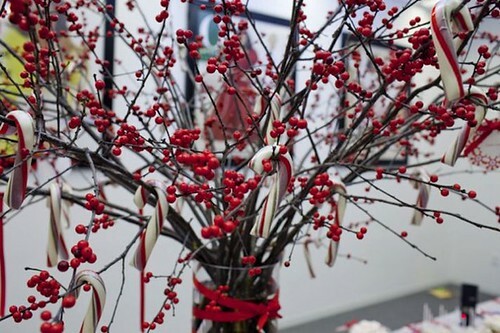 The candy canes hung on the branches are a charming touch. 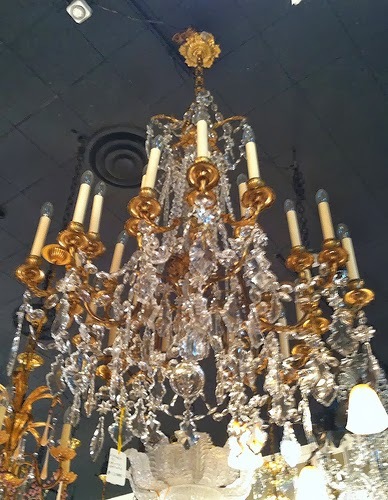 This is technically a table centerpiece, but it could easily be adapted for a center hall table. 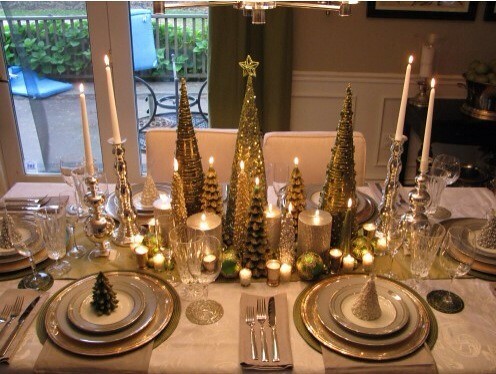 It is really beautiful, with the green and gold trees and candles, and the mercury glass candle stick holders. Found on Pinterest. 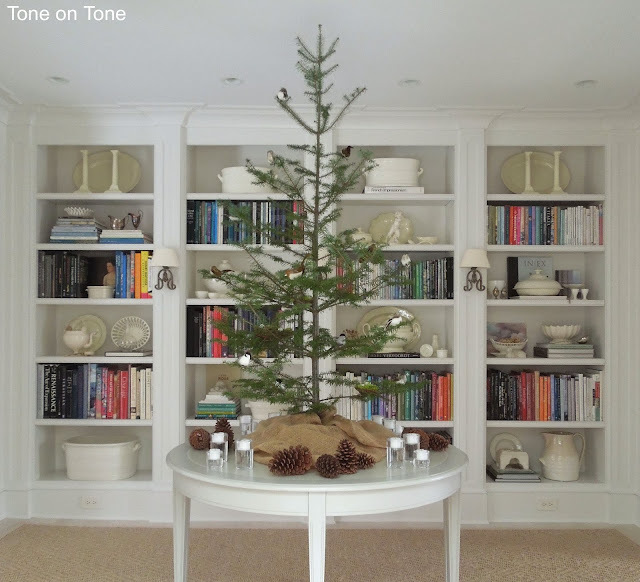 Last year, Loi from Tone on Tone had a small tree cut down and made it into a table top tree. I wish I had remembered this idea when I decorated after Thanksgiving, because I was very taken with the image and idea last year. Here is Loi’s tree from this year – the tree was brought back from Maine, where Loi has recently purchased a vacation house. 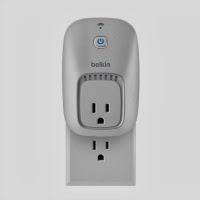 The simplicity and natural feel of the tree are lovely, and there is no need for an electrical outlet with this simple approach (I do not have an outlet in the floor on my entry, nor do I want one). 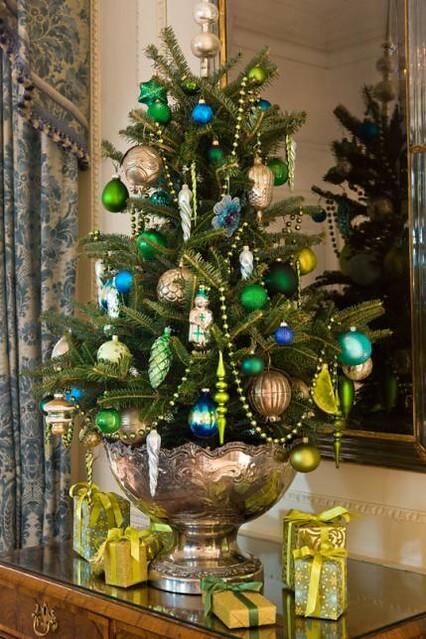 This pretty tree was designed by Barry Dixon, and placed in an antique silver punch bowl. Via Traditional Home. 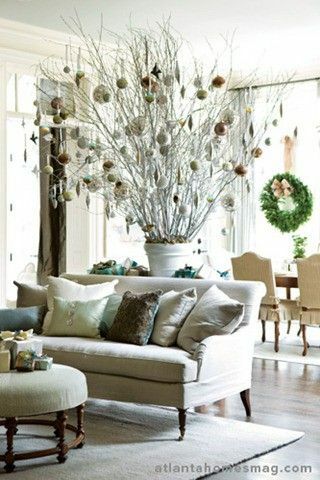 Another pretty example of a tabletop tree, cleverly placed in a wrapped box to conceal the container. This is definitely a designer tree! It has a natural woodlands theme, and could be reused year after year. It fits perfectly on the round table. 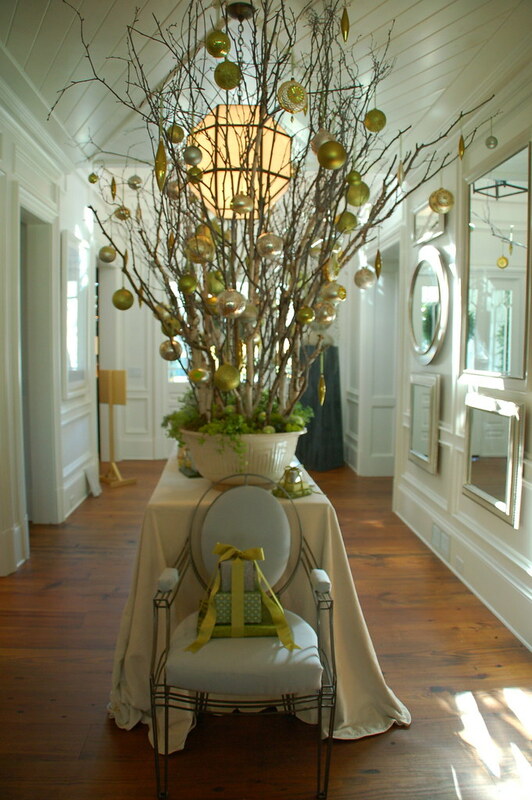 I saved this picture last year, and think it is one of the prettiest examples of holiday entryway décor using a table. 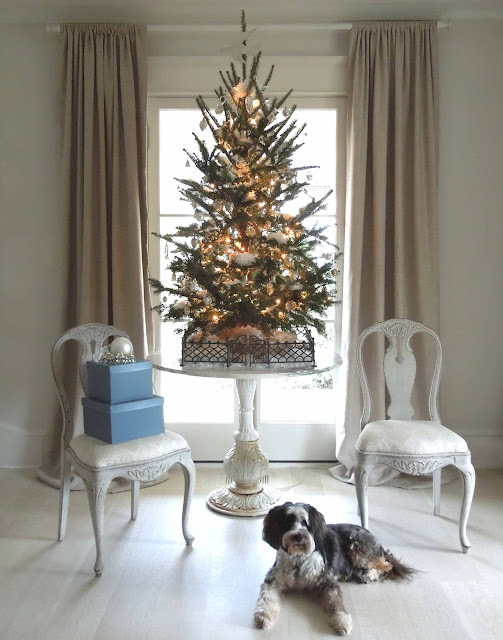 I found this on the Rinfret Interior Design blog – the designer dedicates a tree to her dogs each year, and decorates that tree entirely with dog themed ornaments. What a lovely holiday tradition! Of course, if you have the space a big tree in the entry is wonderful! My sister did this last year in her newly renovated house, but now has a light fixture in the hall and can’t fit a tree. 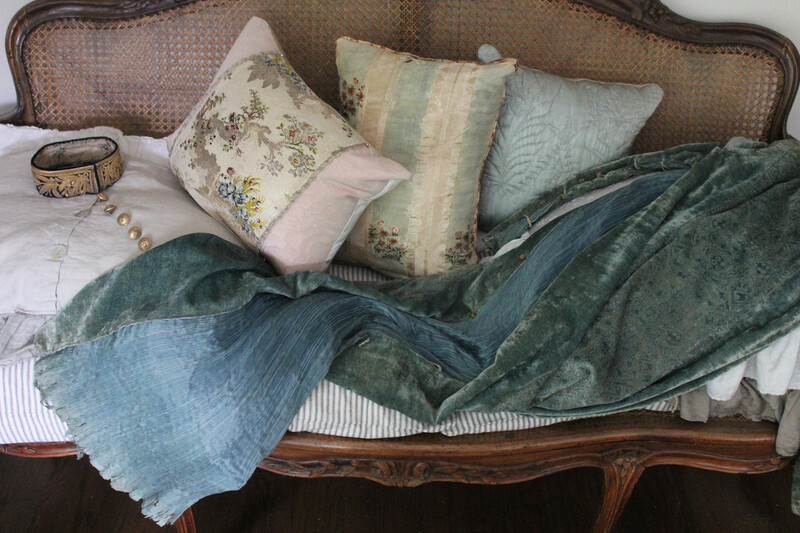 This beautiful picture is from The Enchanted Home. 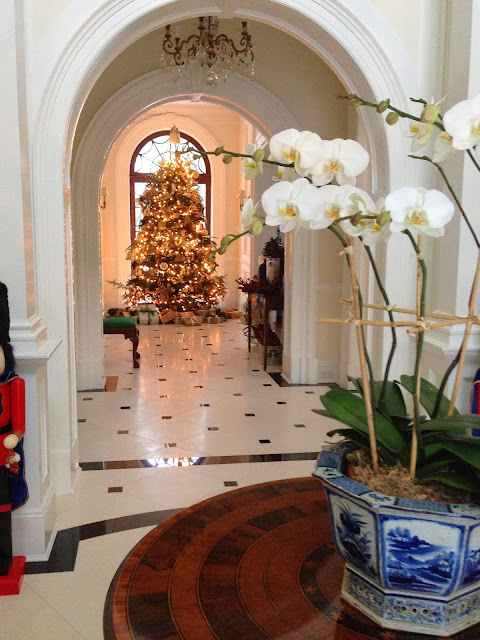 To see more of Tina’s house decorated for Christmas, visit her post. 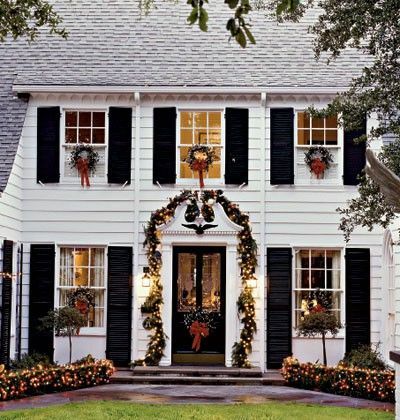 Do you decorate your entry for the holidays? If so, what do you do? 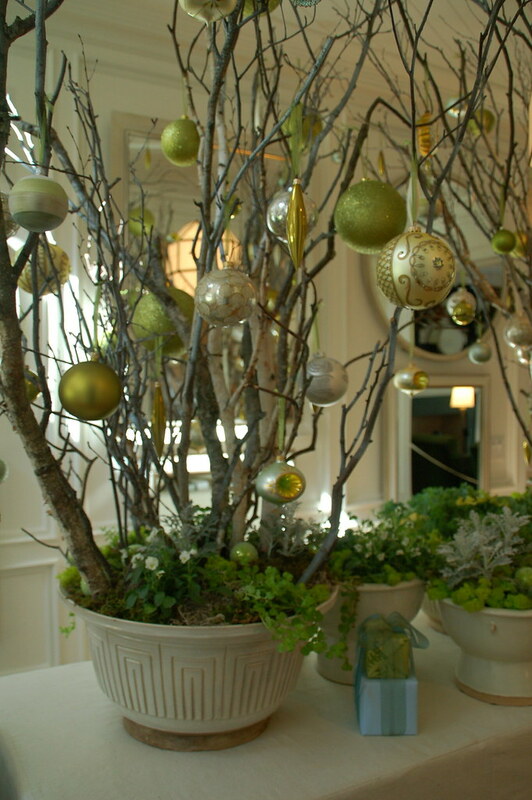 Next year, I am determined to come up with something special for my entryway – maybe I will do a tabletop tree! Click here to comment. 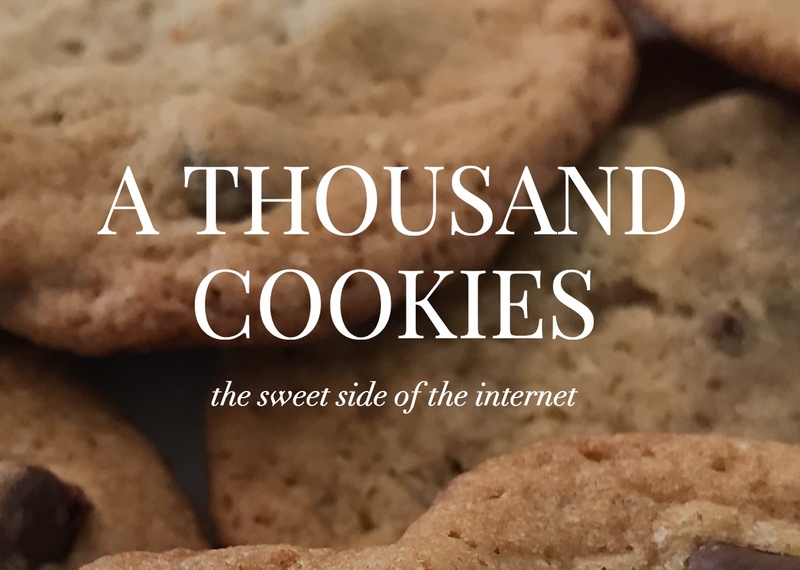 Come visit some of my December blog posts! Such a festive post in the weekend before Christmas! 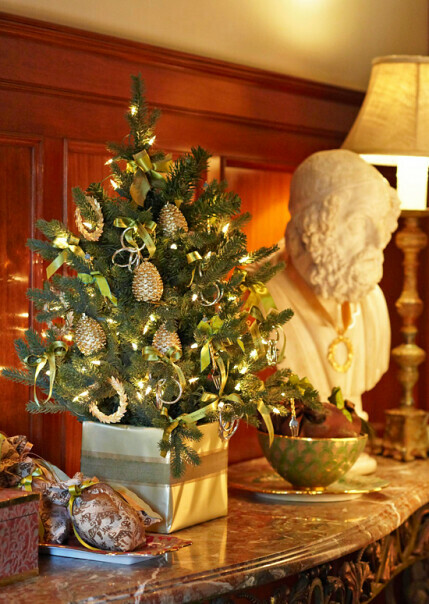 I like the Barry Dixon tree, planted in an antique punch bowl. No need for lights if you use brightly colored ornaments. I don't have an entry per se, but I like to use greenery on my door to set that holiday feeling. Beautiful, beautiful post. Merry Christmas to you! Recuperating from our party last night.....my feet, oh my poor feet! But it was fun and everyone had a great time, and it made decorating the house for the holidays totally worth it, to see so many enjoy it. Hope you are ready for Christmas and get to have a relaxing and wonderful day! I loved looking at all the images you posted, soaking them in. This year our center table is piled high with design books as our work has spilled into our house... Last year Sally and I did small single tree on the table - no lights, hand made ornaments and family favorites. It was perfect. 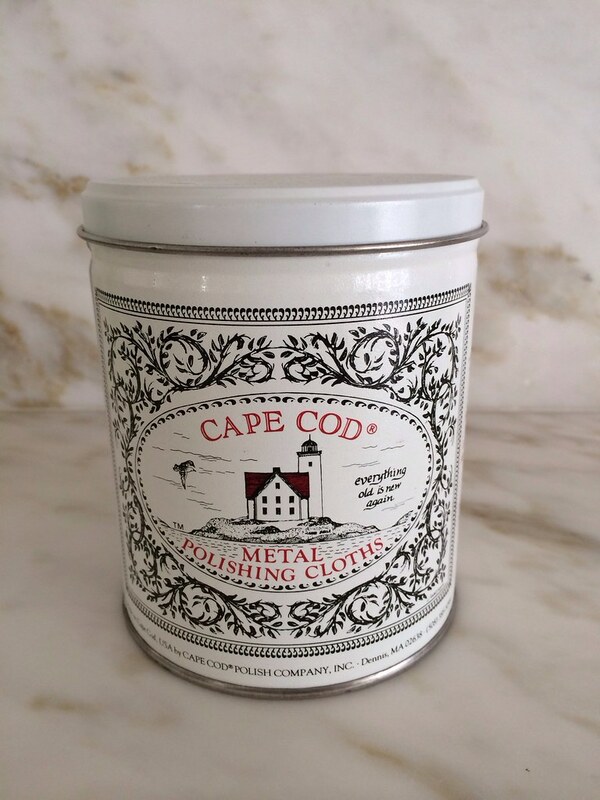 My fav is the very simple decor in the entry way of the Traditional Home image - essential and evocative. Have wonderful Holiday, Holly. Beautiful Holly….hope you have a wonderful Holiday! yes - 'our' old house had an open stair when you walked in and we used live greens as garland as well and I wove in a few red berries from the yard usually. 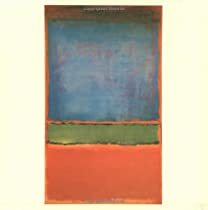 I liked to keep it simple. However in the new Georgetown house there is only a tight little vestibule and nothing to decorate! I had wanted to find mini wreaths for the chandelier to wrap each 'candle' but couldn't find them anywhere and ran out of time. Dim lighting hid the undecorated vestibule for our party and put more emphasis on the very decorated living and dining rooms haha.